Who said space missions are a waste of money? 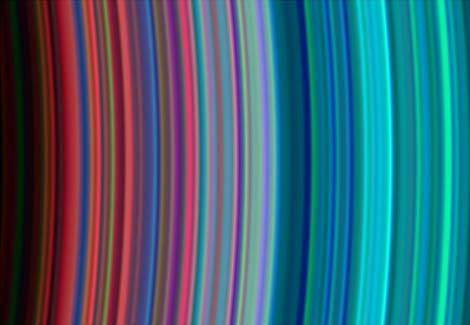 Head on over to Cassini-Huygens's home page and download awesome full-res ultraviolet close-ups of of Saturn's rings for your desktop background. My favorite, above, shows the B and C rings. Cost (to the US) of 2.5 percent of an Iraq war. I guess this puts slightly curved colored lines somewhere near the median of US government expenditure efficiency. Reminds me of Jeremy Blake. Indeed, you are right, Tim. reminds me of Rem Koolhaas' proposal for a new (pre-expansion) EU flag. Reminds me of a bad acid trip. Oh, wait a minute. No it doesn't. No no, it's more like the latest line of shirts by Paul Smith. 15/07: Jame: No no, it's more like the latest line of shirts by Paul Smith. 13/07: Matthew: Reminds me of a bad acid trip. Oh, wait a minute. No it doesn't. 12/07: tim: Reminds me of Jeremy Blake.